Buildings in West Hollywood identified as possibly at risk of earthquake damage. 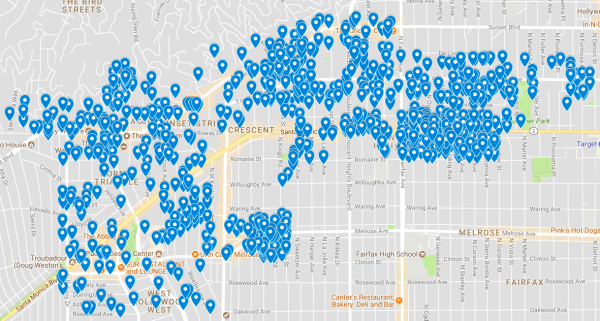 The West Hollywood City Council on Monday will decide whether and how to require tenants of rent-stabilized apartment buildings to share part of the costs incurred by landlords to retrofit those buildings that have been deemed vulnerable from damage by an earthquake. 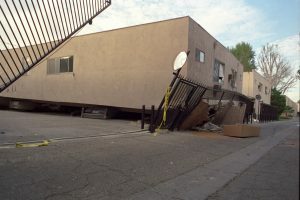 A collapsed soft story apartment building after the 1994 Northridge earthquake. One alternative to the proposed cost-sharing ordinance would be to allow owners of rent-stabilized buildings to use a current provision in city law under which they can appeal to the city for a rent increase to cover the actual costs to them of building maintenance if those costs mean they are no longer getting a reasonable return on their investment. The retrofit cost-sharing proposal has been somewhat controversial, with tenants who have attended community meetings on the matter objecting that they shouldn’t be required to share the cost of maintaining a building they don’t own. However, City Council members and city officials have expressed concern that owners of rent-stabilized buildings might decide to sell them and get out of the rental business if they are forced to cover the costs by themselves. Under the state Ellis Act, building owners can evict rent stabilized tenants if they leave the rental business. Typically the property would be sold to another developer who would turn it into condominiums. In fact, local real estate agents in recent months have been approaching owners of rent-stabilized buildings to encourage them to put those buildings on the market. The proposed ordinance is near the end of the City Council’s lengthy Monday night agenda, which may result in fewer residents turning out to address the matter. The City Council meeting begins at 6:30 p.m. in the City Council Chambers, 625 N. San Vicente Blvd. south of Santa Monica. Parking is free in the five-story structure behind the chambers with a ticket validated in the lobby. Thank you to the Mayor and the members of West Hollywood City Council for this decision. It will be a big help to the Seniors who are hoping to age in place here in WEHO. This $38 dollars goes a long way for us. Renters are not necessarily staying in one same unit for an indefinite/undetermined time unto death. Thus, and because renters have no “equity” in a structure they currently occupy, renters should have no reason to be paying for the essentially “temporary security” of anti-seismic retrofitting which is in fact a subsidy of the owner’s long-term investment. Owners (and municipal entities) are responsible to provide such safety. When we were landlords in Silver Lake, we retrofitted our house with no charge to tenants since it was for the safety of the tenants, the longevity of the house, and the fair thing to do for renters who would not eventually ever “cash in” on the sale we at one point did indeed make once they moved out. Likewise property owners should not put the tenants of Historic Buildings in the line of fire when it comes to mandated restoration Mills Act contracts while they reap the tax benefits. Real estate is a cash business. If you read the NYT article re Trump family finances/wealth retention, you would decide to only ask the owners to pay. Sac Bee did an article on private equity ownership of property in the state. If you want to see an interactive map, let me know.